As the Olympic events continue to unfold over the weekend, people from all over the world have their eyes locked on to the medals table to determine which countries emerge as the overall Olympic champions. While we wait for the final results of Rio 2016 Olympics, our team has developed the most comprehensive leaderboard of global Olympics sports research ever seen. 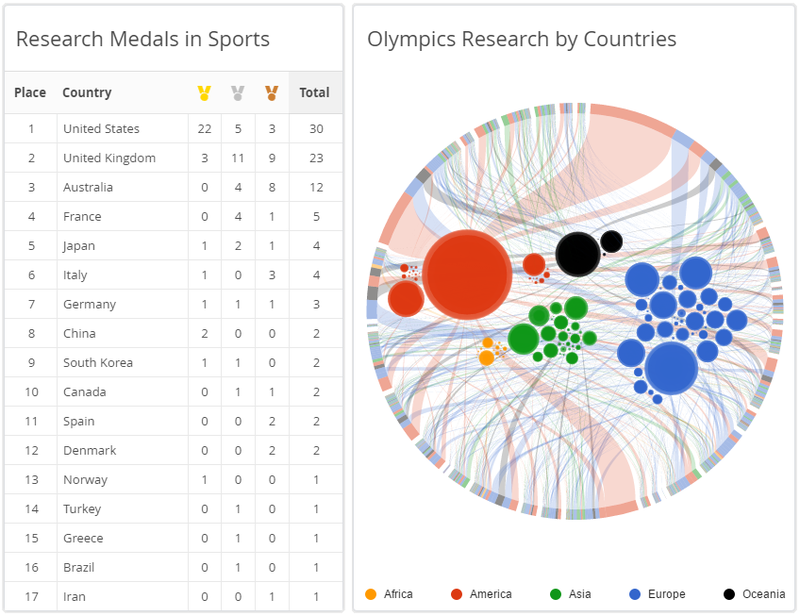 Today we are launching the Olympics Research Medals dashboard, in addition to 32 sport specific dashboards that we launched last weekend, aggregating the global research activity across all Olympic sports. We applied computational linguistics and machine learning algorithms using the world’s largest research knowledge graph, wizdom.ai, to intelligently analyse the 78 million research publications written by 50 million researchers and established 2.7 billion facts about more than 1 million topics. 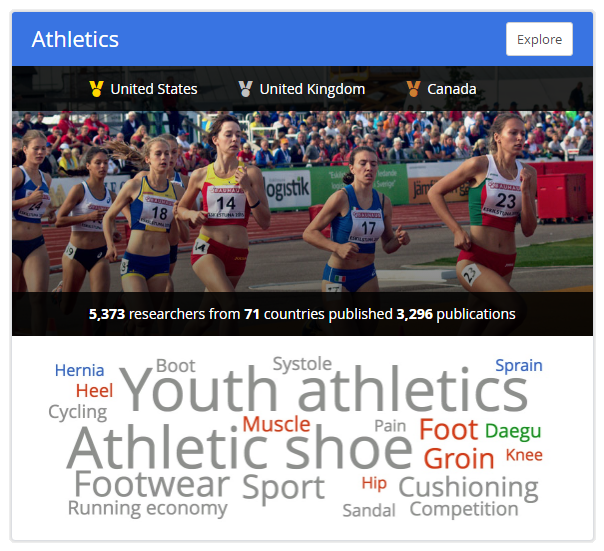 This Olympics Research Medals dashboard aggregates 32 Olympic sports related topics to identify their leading countries, institutions, researchers, journals and most influential publications in the fields. According to the rankings generated using wizdom.ai, United States leads global sports research by a wide margin as it wins gold for research in 22 sport fields. United Kingdom ranks second in sports research overall with 3 gold, 11 silver and 9 bronze, while Australia ranks third with 4 silver and 8 bronze medals. For each of 32 sports covered there are 3 medals, altogether these 96 medals have been won by a total of 17 countries from among the 118 countries that have sports-related scholarly output. Along with the medals table, we have provided an interactive data visualisation presenting the research publications by each country in every Olympic sport – you can explore it on Olympic Research Medals Dashboard. Going further in our study, we analysed the works of 44,579 sports science researchers from 8,437 research institutions in 118 countries that have been published in 3,723 academic journals. In addition to the country-level rankings and scholarly output visualisation, the dashboard also presents the world’s top 10 leading sports scientists, research institutions, and the journals publishing the most research related to the 32 sports covered by us. These are ranked by number of publications and by their relative citations – you can click on the columns to see their rankings by relative citation score. To rank countries according to their sports focus in research, we have also calculated the proportion of each country’s sports related publications compared to its total scholarly output. 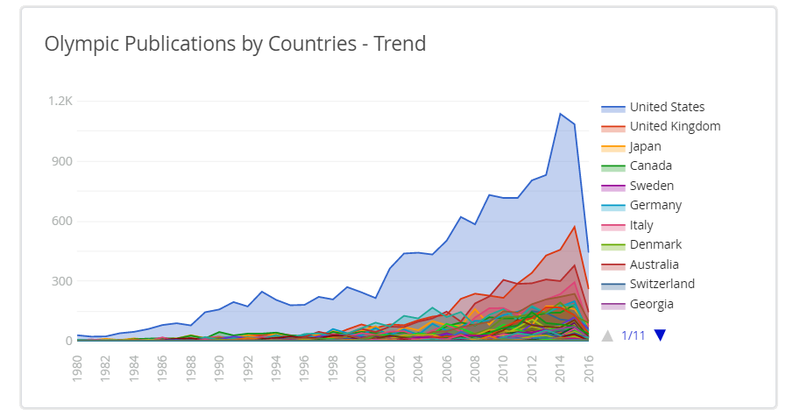 According to our analysis, global research activity around Olympic sports has increased significantly over the past 15 years. Among countries, USA alone has published more research papers overall as compared to the next 4 countries altogether which include UK, Australia, Japan and Canada. You can dive much deeper into your favourite sports by exploring the 32 unique dashboards featuring individual Olympic Sports and find out which are leading countries, researchers, institutions and journals related to your favourite Olympic Sport. The Olympics Research Trends Dashboard provides an unprecedented resource hub for the Sports Science research community, including researchers, coaches and athletes specialising in each of the games to analyse their research landscape globally and at a country level, and monitor how it evolves overtime in future. It is also a valuable resource for the sports’ fans around the world, allowing them to appreciate and explore the extensive research that underpins players’ performances as we watch them compete in the Olympic Games. colwiz, a startup from the University of Oxford’s Software Incubator, recently announced wizdom.ai (details in our blog post here), the world’s largest research knowledge graph powered by big data analytics, machine learning and artificial intelligence. wizdom.ai contains 2.7 billion factual data points, interconnected with 78 million publications, 700 million citations, 50 million researchers, $700 billion in research funding, 60,000 journals, 50,000 institutions, 289 million concepts and 150 terabytes of web crawl data. Our previously launched Brexit Dashboard was featured in the WIRED magazine and Fast Company and shared widely on Twitter and Facebook – people from 1700+ cities in 120+ countries visited our site to explore our dashboard.